Turtletopia » Blog Archive » Tiny Turtles Illegal in Florida! Well…not quite yet, but as of July 1st, turtles smaller than 4 inches in length will be illegal to own. Stores have already stopped selling turtles as of last July, in compliance with a Florida state law outlawing the sale of exotic creatures. The law comes from having so many red-eared sliders released into the local population. Being quicker on land and in water, the turtles are overrunning the locals and interbreeding, creating a new species of turtle. So, while you may have a red-eared slider now, in the future you will have to apply to the Florida Fish and Wildlife Conservation Commission for a free permit to possess the turtles. If you live in Florida and you own one, consider yourself lucky to do so. CORRECTION: Thanks to reader Katrina, we’ve been informed that it was actually the sale of red-eared sliders that was banned in Florida due to their cross breeding with the native yellow-bellied sliders. Please see her comment below for the full details. i do not like that law! i dont live in flordia but that law still seems harsh! they are baby turtles you people! they are not monkeys! they should not make that a law! What do I do when a Turtle sits outside in front of my door? I live in SMELLRAY BEACH FLORIDA…. I’ll be answering your question in my next advice column Mr. Turtle Head, so stay tuned! @ bob g – These are red eared sliders. Actually, the sale of turtles under 4″ has been illegal in all 50 states since the mid 70s. It’s the sale of RED-EARED SLIDER turtles was banned in the last couple of years in Florida, because red-eared sliders are not native to Florida and can cross-breed with the native yellowbellied sliders. And those cute little babies can grow to be 6-12″ with proper care, needing at least a 75 gallon tank, and live to be 20-60 yrs old. 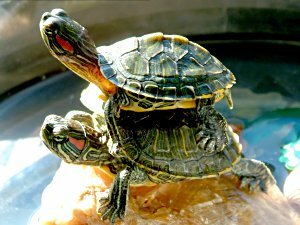 It’s illegal to release turtles acquired from a pet store or breeder. Ah, thanks for the clarification Katrina! I’ll find a way to work it into the blog post. What do you do if you bought 2 of these red eared turtles from chinatown and thought that they would stay really little?? Can you sell them back to the store?? Would Petco take them? You might be able to sell them back to the store, but there are no guarantees. Petco I’m sure would not take them. Your best bet is to take them to your local animal shelter and see what they can do for you. Good luck! It’s a shame that people are so irresponsible, they purchase pets, get tired of them and dump them. I’ve had a red eared slider for over 10 years now…a friend had purchased a small one for his son who wouldn’t take care of it and he was going to put it in the lake behind his home. She was so sweet I took her and haven’t regreted it for one second, don’t get me wrong, it’s a constant battle keeping her pool clean, making sure her diet is consistant with her needs, making sure she’s let out in May and June to lay her eggs (no male so they’re not fertile)…but she’s worth it…if we keep pets they depend on “us” to take care of them and all their needs, and in return they give us so much joy and plenty of laughs. No, there haven’t been any changes in the law that I know of. However, the best source for that is the Fish and Wildlife office. I suspect that they are selling them under the clause that they are strictly for scientific, educational, or exhibitional purposes. Use as a pet does not fall under that clause. Hopefully they are asking each and every customer what the use is for, if not, they could get into some serious trouble with the state and face fines. I suspect most stores don’t ask their customers what the turtles are for in fear of losing the sale all-together. The store is breaking the law, pure and simple. It’s still illegal to sell a “normal phase” red-eared slider in FL, and it’s still illegal to sell a turtle under 4″ “in connection with a business” unless for “bona fide educational, scientific, or exhibition purposes”. The FDA does not consider a pet store, mall kiosk, or road side vendor to be “bona fide”. Trying to give away baby turtle with the sale of a tank and/or set-up constitutes as “selling”. Just giving a baby turtle away, or selling one by a hobbyist, IS legal, though. Recent events have been confusing, and some people think the federal 4″ regulation has changed, but it is still in effect in all 50 states. Thanks for clarifying that Katrina. I was having a hard time finding updated information on the law online. Great! So I just bought 3 tiny turtles @ a souvenir shop in Florida. The guy told me they would stay little and all I had to do was feed them once a week and keep them warm. They are not the red eared kind but look the same otherwise. I live in Ohio & brought them home for my kids! Any advice? I don’t have a filter but clean the water every week. Heather, not much you can do at this point about having bought them and brought them home. However, you’ll want to figure out what kind they are, just to make sure you are taking care of them appropriately. Also, as they get older, with that many turtles in one tank, you will need to give them a large space to roam and eventually add a filter, basking area and heat lamps. But my recommendation to you is to find out what kind they are and then go from there searching for the appropriate care sheets online. Enjoy! Katrina is correct….I work a pet store in florida and have stopped selling baby turtles awhile back, especially when I called the FDA to find out about this law. They Stated “yes” the law is in effect still. Now Florida has banned red ear turtles…..but my competition down the street is still selling turtles with that same note on the tank “sold only for educational purposes” which like katrina states is illegal. Turtles cant be sold as pets from ANY commerical business to the public. now a distributor of turtles can sell to a scientific, educational, or exhibition instit..
Heather, you can report the store that sold the turtles to the FDA (especially considering they lied about how to care for the turtles and how big they get). I’d recommend http://www.turtleforum.com to help ID the turtles. Yellowbellied sliders, maps, and cooters/redbellies are also commonly sold as hatchlings in tourist areas now. No. Your pet turtle has never had to avoid predators (larger fish, raccoons, birds, larger turtles, alligators if you’re in the right part of the country, etc.) and would be an instant meal. It also has no idea what to eat in the wild. Release your domesticated turtle can also introduce diseases into the population. If a turtle was purchased, it should NOT be released, it should go to a rescue group or to an individual with the knowledge and RESPONSIBILITY to keep it alive. Please talk to your local animal shelter to find a home for the turtle.